Aussie markets to close for 4 days. 'Hold my beer', says Japan, markets close for 10 days! Trump tweets that the stock market would be 18-35% higher if Fed had "done its job"
A little USD weakness to open the week here in Asia with EUR, GBP, yen all ticking a little better against the big dollar. There was plenty of weekend news and comments from central bankers and what have you, but nothing to surprise markets. Data flow was sparse and only of lower-tier importance. Brexit murmurings will continue, but the near-term pressure is off. Cable gathered 30+ points today in a lacklustre session. Elsewhere ranges were narrower. USD/JPY popped above 112 in the Tokyo morning. 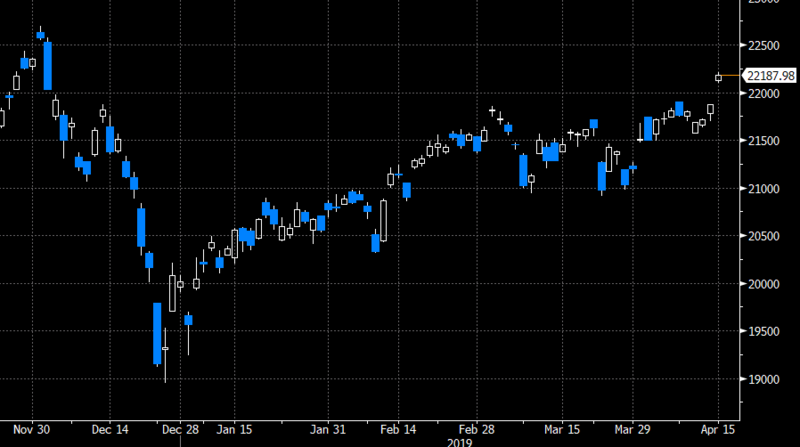 The Nikkei hit heights last seen in early December last year. While USD/JPY has drifted off back below the figure (in a very small range) the stock market index is barely off its morning high (as I post). AUD/USD and NZD/USD are both little changed. NZ Q1 CPI data is later this week - a focus. Australia Q1 CPI follows next week. The Reuters headline the US is back pedalling on demands in China trade talks (unnamed sources, admittedly) failed to have much of an impact on the AUD.